A proven track record by successful online programs that are largely administered centrally, balanced with a component of local input. If adopted by CUNY, what would such a program encompass? As the diagram below indicates, a COHOL entity would cover several essential hybrid/online issues, including policy, coordination, collaboration, resources, guidance, and strategy. I will briefly describe the need for each. Coordination — A central office can do a great deal to help coordinate the efforts of local campuses without the heavy hand that some fear. Faculty development, technology research and purchase, documentation for faculty and students, and establishing administrative systems to allow for cross-campus registration are just a sampling of how a central office can be of assistance to local campuses. Failing such coordination, a tremendous amount of duplication of effort, inefficient resource and budget allocation and lack of overall planning will result. Collaboration — If college A has an online program that may dovetail nicely with select courses from College B, a central office may help facilitate that collaboration. Collaborations of a strategic nature, be it internally within CUNY or externally with other schools, vendors, or entities, is reflective of more mature online programs. It represents, according to my schema, the next step in online development after online program implementation. For these collaborations to really help the institution rather than just the individual college, you need a central office to properly plan such collaborations. Resources — When budgets are tight, as they currently are, a central office may be able to assist with additional resources, as they already have with hybrid faculty development funds for CUNY campuses. A central office may also assist with grant-writing support and staff to coordinate cross-campus hybrid/online activities. While it would not be prudent or practical to have all resources administered centrally, a reasonable balance can be struck between the needs of centralized versus decentralized funding mechanisms. One further note: With online enrollments growing at 10 times the rate of traditional programs (1), there needs to be a reasonable chargeback program by the central office for enrollment increases created by online courses. Should enrollments be capped for online courses? Should students need to meet some criteria prior to enrolling in a hybrid/online course? Should faculty training or certification be mandatory prior to teaching a hybrid or online course? Are hybrid/online courses considered “experimental” or lacking full acceptance as traditionally taught courses? How is developing and teaching a hybrid/online course weighed in tenure and promotion decisions? I have collected over 30 such policy issues (for another post) that 23 colleges are currently addressing separately. Some guidelines, even short of actual policies, would go a long way to help resolve lingering and ongoing questions in this arena. 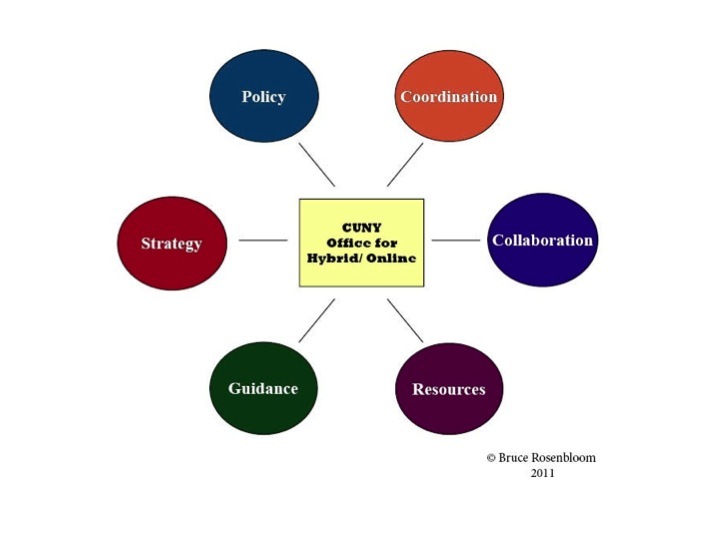 Strategy — As I’ve discussed in a previous post, hybrid/online is in alignment with CUNY’s mission, values and programs. However, we lack an overall strategy and vision when it comes to hybrid/online. A central office can start a process, with input from all campuses, toward building a real strategic plan for hybrid/online at CUNY. Every successful online program has such a plan — some even available publicly. The plan speaks to the role of hybrid/online within the institution, what that institution aims to accomplish, the resources available for hybrid/online, and a timeline for implementation by that institution. In summary, I believe that given the current stage of hybrid/online development at CUNY, the time is ripe for a greater centralized presence in this critical area. I am proposing a new office — The CUNY Office for Hybrid Online Learning — to fill a policy, strategy, coordination and implementation gap that currently exists. This office can help bring this institution to subsequent stages in hybrid/online development. Fulya Olgac, Graphic designer for “The Central Issue” graphic. This entry was posted in CUNY Practices, Envisioning Online, Online Best Practices, Online Learning Policies, Procedures, Systems. Bookmark the permalink.